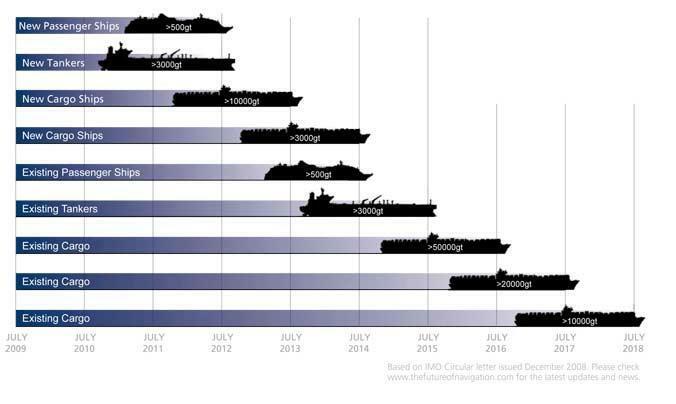 IMO regulations stipulate that in accordance with the above timeline, the included vessels are required to fit an Electronic Chart Display and Information System (ECDIS). If then used as the primary means of navigation, those members of the bridge team who will be utilising it are required to have completed approved generic courses as well as type specific training in the systems they will be operating. Unfortunately a number of incidents in recent years have demonstrated that shipping companies fit the ECDIS but don't train the crew to an acceptable level or that crew don't set-up the equipment properly or with adequate procedures in place which then results in groundings. Forming part of Da Gama Maritime’s ECDIS Accreditation package or available as a standalone course, we are proud to recommend mariners to our partners at 'ECDIS Limited' or the Warsash Maritime Academy, both based in Southampton, England to deliver an officially accredited course to the IMO 1.27 course model in addition to approved type familiarisation training. While Risk Assessments are no longer formally required by Flag States as part of the accreditation process for a vessel to navigate primarily by electronic means, these documents and the procedures developed within them have been found to be extremely useful to vessels by forcing the bridge team to look closely at their practises and determine whether they would stand up to scrutiny in an emergency. The navigation based staff at our company have years of experience in the use of ECDIS and have worked with a number of manufacturers to improve the software and make it more useable to the mariner. Through this we are able to provide training in the more practical use of ECDIS on board vessels and as part of our training package, work with bridge teams to enhance the way they navigate by electronic means. Taking navigation as seriously as we do in this company, we've also established the e-Navigation series of conferences. Running for the past five years in London, this annual conference brings together key figures from the industry to debate and improve the navigation standards in an attempt to further promote safety at sea as we move into a more digital age. Additional information can be found at this link.